I started my consulting business building simple web pages for friends and later expanded to small businesses in the Lake Tahoe area. My approach has been to use web pages as an electronic business card to attract customers through internet searches, to give customers a feel for the business, and to get them to make contact to learn more or to make a purchase. This approach allows the web page to be simple, direct, and quick to deliver. If you would like to learn more, contact me. Below are some examples of what I mean. A web page should deliver your message and get the viewer to contact you. Web pages can be effective without being complicated. Text tells your story, answers questions and gets customers to act. Links allow access to other resources. Search engines should list you in the top group. Ignacio White Eagle died on October 9, 2007 and left a legacy of love, spirit, and art. 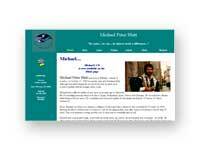 This web page was originally built to display his art, but now it serves as a memorial to his spirit as well. Lani Churchill and her husband Tom perform natural wedding ceremonies in Hana, Maui, Hawaii. Their web site reflects the spiritual peace and simplicity of the unique ceremony they are able to help couples create. Tom's wonderful photographs capture the happiness and the spirit of Hana. Gunner Henrioulle started this web site to encourage the use of vintage rail cars as a transportation alternative for urban and resort areas, such as Lake Tahoe. Norma Santiago's campaign for El Dorado County Supervisor, District 5, needed some help with a web page and I was able to help out. I hope the page reflects the dedication and enthusiasm that Norma brings to serving county residents at Lake Tahoe. Africa and North and South America. 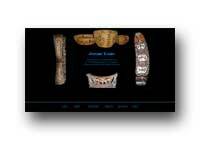 He wanted a web site to display and sell his collection of very interesting native art. After finding high levels of radon gas in my own house, I decided to create a web page to help others discover and get rid of this naturally occuring yet very unwelcomed radioactive gas. Sandy Allie is a talented sculpture in the Tahoe area who is becoming well known in art circles around the country and abroad. Carol Lehnert's web site showcases her unique artistic talents in paper sculpture, water color and digitally created mandellas she calls "obulettes" because of their spiritual connection. Bill and Penny Burroughs teach quilting classes, do machine quilting and sell fabric to quilters from their shop in South Lake Tahoe. Soon they will be using a shopping cart, taking credit cards and selling fabric and quilt kits over the internet. 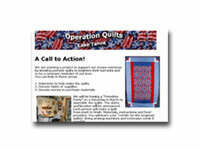 American mothers are getting together to make quilts for America's sons and daughters in the military overseas. 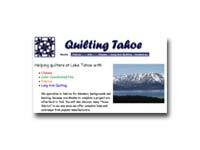 The Lake Tahoe group has sent nearly 50 quilts. The original group in Merrill, Oregon at Tater Patch Quilts and has sent over 675 quilts to warm our troops and remind them that they are loved. Tahoe Region Advocates for Cycling was founded to promote cycling in all of its forms in the Tahoe Basin. The non-profit group has focused on transpotation for commuters and tourists by encouraging agencies to develop safe bike paths, routs and trails throughout the South Shore. This web page is an example of modifying an existing page to make it more effective. 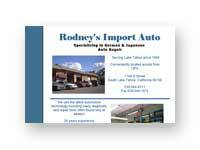 We originally built the page to help Rodney market his business. We were successful on both counts. The page was visually appealing, gave the details about his business and attracted a buyer from Los Angeles. The new owner's page is under construction. 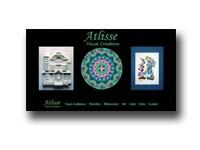 This site was built to get Silvio's art out on the web. 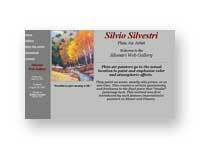 It has the visual appeal of Silvio's great paintings with links to a web gallery of his work, individual pages for each piece and a biographical sketch of the artist. The site also links to current gallery showings and includes a history of Silvio's awards and shows. This page is currently being maintained by Silvio. Paul Camacho was looking for a way to make it easy for insurance carriers to choose his insurance adjusting service for claims in the Lake Tahoe area. 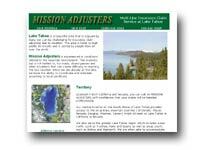 Displaying a picture of Lake Tahoe set the stage for his location and then pages explaining his services and the benefits of dealing with a local adjuster. The Lake Tahoe Chapter of this grief support organization wanted to have a web page to reach people who are grieving over the loss of a child, but might not feel strong enough to attend a meeting. 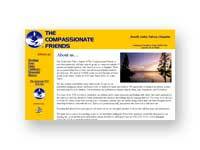 The site explains about grief, how to attend a meeting, and has links to the national web site, the local Children's Memorial web site, as well as other groups and resources. 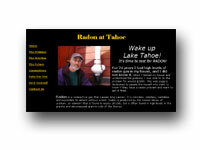 Ole Olson wanted a web site that would explain about termites and carpenter ants in the Lake Tahoe area. He also wanted the site to demonstrate his firm's ability to eradicate pests, his concern for safety and his business values. There are links to other resources on pest control. The TDGA built and maintains the disc golf course at Bijou Park in South Lake Tahoe. The local group of disc golf players wanted a web site that would explain the game of disc golf, show photos of the course, list sponsors, invite comments and dialog. Also the site announces and takes sign-ups for the national PDGA "Super Tour" event, the Tahoe Tribune Tournament, held each year in June. The site links to other local and national disc golf sites. A memorial page to Michael Blatt, a poet, vagabond, philanthropist and friend to many in the Tahoe area as well as in his native London. This page pays tribute to his poetry, wisdom, photos, and even music from his cd, which was published after his untimely death in 1999.